1. 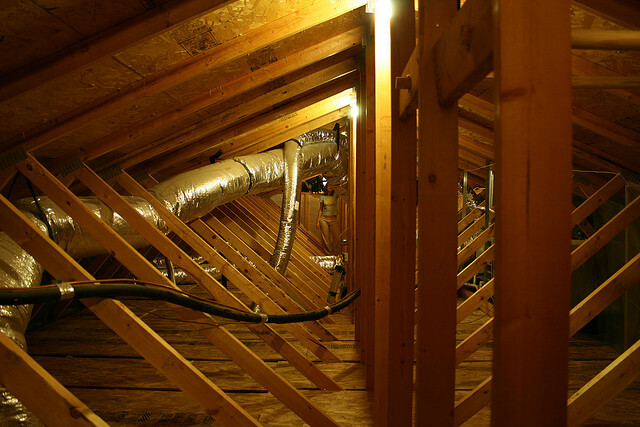 Determine at least three locations in the attic where you’d like to test the temperature. It’s very possible that the insulation in your attic may not be evenly distributed throughout (especially if you live in an older construction home). Because of this, it’s ideal to measure the temperature in at least three locations. We would recommend the entrance to your attic, the middle and the far wall from the entrance. However, if you have an exhaust vents or other such pipes running through your attic we would recommend measuring the temperature where those vents/lines enter and exit the attic as well. 2. Turn on your infrared thermometer and aim it at your first location. Be sure to aim the thermometer at multiple spots around the location your trying to measure, this will help you find any drafts or air leaks and will give you a better idea of the temperature in that part of the attic. 3. Repeat step #2 for all the locations you’ve selected. Now that you’ve determined the temperature in your first location, repeat step #2 for all the locations you’re going to measure. As you’re doing this it’s a good idea to write down the various temperature readings, you’ll want to take an average of all your readings to get an idea of where your home’s attic temperature is relative to the recommendations set out by the Department of Energy. If you’ve found that your attics temperatures don’t fall in line with the ones specified above, contact a local professional to come in and have your attic’s insulation updated or have a attic fan installed for better ventilation. Looking for more ways to ensure that your home is using energy efficiently? Be sure to check out our green home improvement projects: Green Living Ideas, after all, is a top 20 home improvement website!